Study: Where and when do Indego commuters ride? 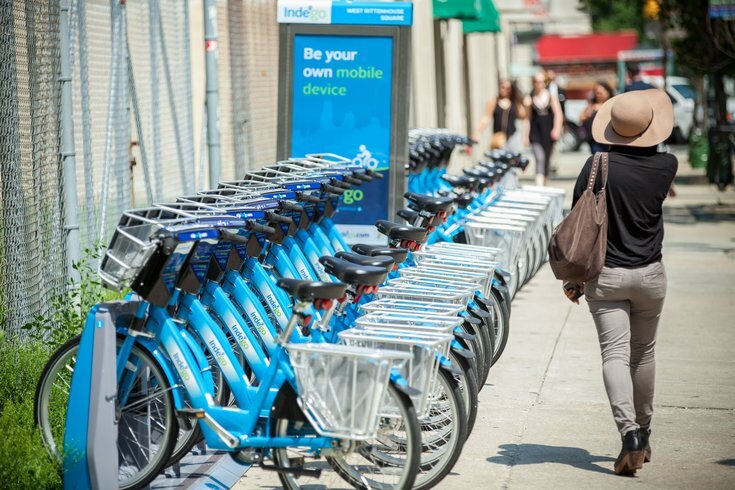 Two inconveniences plague riders of Philadelphia's new bike-sharing program Indego. First, showing up to your local station to find no bikes available. Second, riding to the station near your office or classroom, only to find every parking space filled up. Well, University of Pennsylvania postdoctoral researcher Randy Olson, who has written at FiveThirtyEight, has come up with a solution. Using the city's open data sets, Olson mapped out the usage of each station over a weeklong period in July to find out which stations saw an influx of riders at certain times of the day and which saw an outflow of riders during certain times. What he found isn't surprising, but serves as a useful tool for commuters. As it turns out, riders are using stations farther to the cities corners before and after work hours. Conversely, they are coming to areas along Market Street during the normal work day. As Olson points out, the stations used more frequently during the workday are located near centers of concentrated businesses and colleges: University City, Center City, Temple and Old City. The stations used before and after work hours are in more residential areas: Bella Vista, Northern Liberties and Spring Garden. Olson visualizes more of his data for specific days and stations in his research and says he is open to suggestions on different research approaches to assist Indego riders. Read more from his study here.